For weeks — months, actually — I could do little more than stare at it, this ostensibly precious nectar with an outrageously precious name. 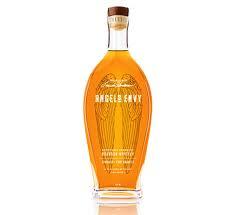 With an infusion of Angel’s Envy, what would become of me? On a recent evening I sipped the serum and experienced … a whiskey sweeter and smoother than most, and appealing to a point. But its taste left less of an impression than its promotion, reflective of how fanciful, even silly, the marketing of boutique booze has become. There is, for starters, that name: Angel’s Envy. I’ll try not to type it as often here as I’ve murmured it to myself, chuckling each time at its reach, its sheer celestial hubris. When you call something Angel’s Envy, you’re inviting mockery and sowing the seeds of disappointment, because you’ve basically promised nothing less than liquid rapture: heaven on the rocks. What were the runner-up names? Zeus Juice? XanaDew?